SparkPost’s Premium and Enterprise plans include enhanced support to provide our enterprise customers with proactive, professional service that is unmatched in the business. 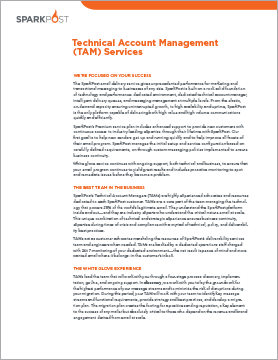 SparkPost’s Technical Account Managers (TAMs) are highly experienced advocates and resources dedicated to enterprise customers. They know the SparkPost platform inside and out—and they are industry experts who understand how critical email can be. This unique combination of technical and strategic experience ensures a successful start as well as ongoing business success and technical best practices. Technical Account Managers help enterprise customers make the most of SparkPost through a four-stage process: discovery, implementation, go-live, and ongoing support. In this brief, learn what TAMs deliver to help our customers succeed and why they’re, hands-down, the best team in the email industry.